Drxmeds.com was an online pharmacy that aims to deliver foreign medicines to their customers worldwide. Information from a third-party website shows that this store started operation in 2011. This online pharmacy is now inactive. The location of Drxmeds.com was not available on their site yet they offer worldwide shipping for free. This online dispensary promises to provide all kinds of medication, even medicines that are still in testing. Among the type of medicines that they used to offer were medicines that were not available in the US, special geriatric drugs, and enhancement medicines. According to their page, this online drug store allows customers to order as many as 60 to 90 medicines. Prescription medicines were also available and anyone can order without a prescription. Allowing patients to have access to prescription medicines is their way of helping customers save money from seeing doctors for check-ups (just so they can get a prescription). Drxmeds.com had a lot of medicines to offer on their site. They offered painkillers, ED drugs, diet pills, antidepressants, hair loss, AIDS and anxiety medicines. Among their best seller drugs were Viagra, Paxil, Periactin, Anafranil, Cialis, and Zanaflex. They also offer HCG, Oxycontin, Prozac, Xoloft, Xenical, and Valium. As mentioned, customers can order as much as 90 pills at once and have it shipped to their location anywhere in the world for FREE. Since drxmeds.com is no longer active, I only gathered limited information about the things that this company offer. There is no information whether the drugs offered by drxmeds.com were safe or if these were approved by the FDA. In their page though, it says that they provide “experimental medicines”. Experimental medicines are drugs that were not approved by FDA yet. With information coming from webarchive.com, I am unable to find data about the payment method that drxmeds.com accepts. This information is also not available from third-party websites. As far as shipping is concerned, drxmeds.com used different shipping methods. They took pride in giving “discreet shipping” to their customers via DHL, EMS, TMT, UPS, and FedEx. The information is limited to these shipping methods they used and costs of shipping are not available. Refund and return policies for this online pharmacy is also not available at this time. For customers who would like to contact this online dispensary, they can click on the “contact us” page and send their inquiring using the form provided on the said page. Customers who would like to speak to their customer support via phone should send them an email. Once an email is sent, wait for their reply and they will email you back the number of their phone support team. Whatever their reason for keeping their phone support’s number was, I find it shady and suspicious. According to an online marketing specialist, customer review is very important because it helps improve the image of the product being marketed. A customer’s review is the best way to measure a customer’s satisfaction as well. Unfortunately, for this inactive online dispensary, customer review is not available. Either they really don’t have any reviews from previous customers or that information were not captured by web archive. Still, reviews from third-party sites should still be available if there were any. With no customer review to use in evaluating the legitimacy of this website, I decided to check its current status from legitscript.com. Legitscript.com is a service company recognized by the National Association of Boards of Pharmacy (NABP) and they monitor and evaluate online pharmacies in terms of complying with health care laws. 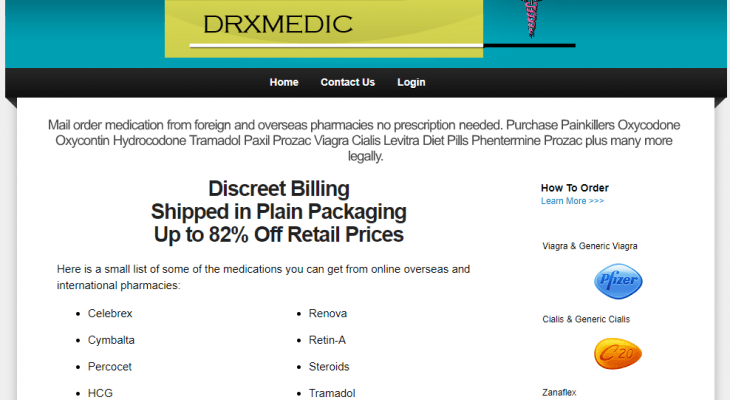 An evaluation from legitscript.com revealed that drxmeds.com was a “rogue online pharmacy”. When legitscript.com reports an online dispensary as a “rogue online pharmacy’, the National Association of Boards of Pharmacy (NABP) normally takes action and shuts down the site. This could be the reason why drxmeds.com is no longer operating. Aside from legitscript.com, I also checked the status of drxmeds.com on scamadviser.com. According to scamadviser.com, the location of drxmeds.com is unidentified (perhaps because they are no longer active) and the site was listed as a “threat site”. When shopping online, I always aim for the store that offers the best price with the best promotion such as free pills or free shipping. Luckily, drxmeds.com offers free shipping worldwide and they had been using it as their ultimate promotion to lure customers in ordering from them. According to their promotion, customers who order from drxmeds.com, regardless of the amount of purchase can have their orders delivered for free. Drxmeds.com is an online store that had a lot to offer. They had extensive list of products from different pharmacies worldwide, they processed orders legally, they had thousands of medicines available for shipping, they allowed customers to order up to 90 different medicines, they offered experimental medicines (the promising ones perhaps), they had ED and sport enhancement drugs and they had special geriatric drugs. Among the experimental drugs, they used to market were experimental AIDS and hair loss drugs. Drxmeds.com also shipped without asking for a prescription. With all the great promises of drxmeds.com comes different questions. Did they offer FDA approved medicines? Where were these drugs manufactured? Were they safe to use? Were there any customers that can prove the reliability of drxmeds.com? Why did they close down? With a lot of unanswered questions, I really have a suspicion about this online dispensary. One thing that heightened my suspicion was the fact that if I need to contact their support team, I will need to send them an email first and they will email me back with their phone number! Why were they hiding their support’s phone number? With all the unanswered questions that I have for drxmeds.com, I am giving this site a rating of 1 out of 5 stars.